Pork tenderloin or ‘varkenshaas’ is quite common in Belgium. We house many pig farmers near our coastal plains and the rural Ardennes in the South, and pork makes a frequent appearance in Flemish & Walloon cuisine. Pork is often served alongside a fruity ‘compote’ or warm, chunky fruit stew typically made from apples, rhubarb or apricots. It seems Belgian cuisine tends to favor fruity additions to savory dishes, and to date, I still like the sweetness fruits give to hearty stews or braised meats. The problem with pork is, is that it often turns out a bit dry and flavorless. It doesn’t help that for years America’s preoccupation with food safety had everyone convinced that you have to cook pork until it’s well-done, and that’s a sad myth. It gave pork a bad reputation. While you shouldn’t eat pork raw, it’s perfectly safe to cook it to medium doneness, so it’s still juicy and a bit rosy on the inside. Roasted into a tangy, caramelized feast and paired with a fruity sauce, pork is delicious! Below is my take on this Belgian classic. In a medium sauté pan, add all of the ingredients and let simmer for 10-15 minutes. Meanwhile, prepare the meat. If the consistency is too thick, add a little more chicken broth. Rub salt and pepper on the tenderloin, then add the whole-grain mustard and coat all sides. On a foil-lined baking sheet, place the pork tenderloin under the broiler and rotate every 3-4 minutes, until the internal temperature reads 135F for a tender medium rare. Let it sit for 5 minutes before serving. 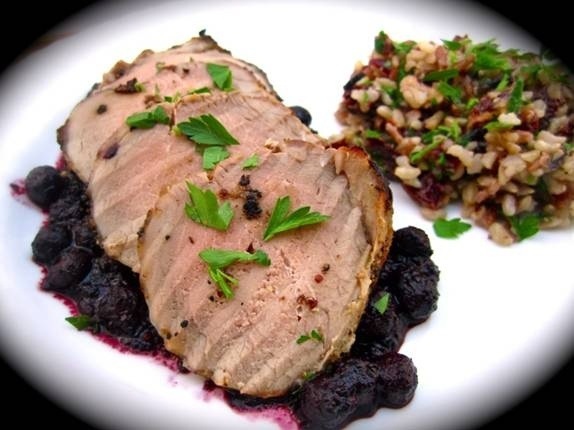 Slice into medallions and serve with Balsamic Blueberry Reduction.